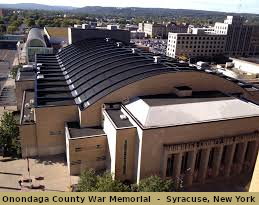 While this particular page really had nothing to do with 62 WHEN, (It appears the concert may have been a WNDR co-promotion) it is an interesting look back at the early history of rock n' roll in Syracuse, New York. To say nothing of being a fun read. FLASHBACK!!! 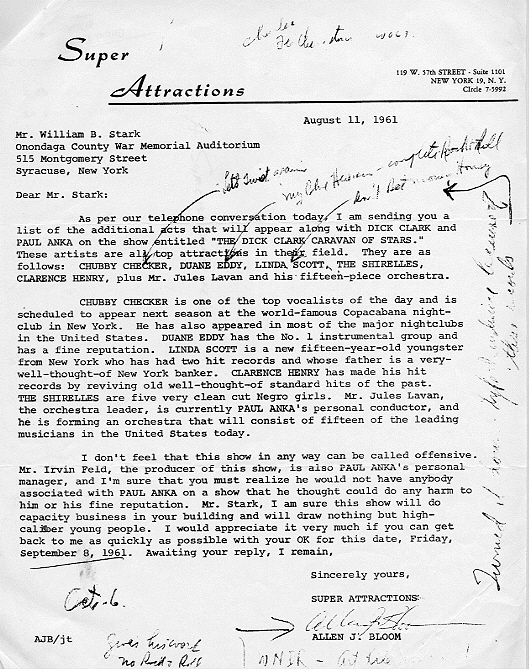 Over fifty years ago, this letter was written by show promoter Allen Bloom to William Stark at the Onondaga County War Memorial in Syracuse on August 11, 1961. Mr. Stark ran the auditorium at the time and was deeply concerned that this was going to be a "Rock n' Roll" show. Note the handwritten notes on the letter which were probably made during a phone call from Mr. Bloom. One notation near the bottom of the letter states... "gives his word... NO ROCK N' ROLL." The reassuring Mr. Bloom, in this letter, almost painfully points out to Mr. Stark, that these young musicians are nothing less than the finest and cleanest cut entertainers ever to come to Syracuse... and to say nothing of "the high caliber " young concert go'ers who likely would attend this event.